This summery weather (averaging 75-80º for the last couple of weeks) has been a shot in the arm to our plants. The potatoes (foreground above) are sprawling and starting to bloom. Peas and beans are shooting skyward. We planted out our tomato seedlings 3 weeks ago and they’ve more than quadrupled in size. The broccoli got confused and started to flower the second they began to form the green heads, before we could cut any. Oh well. 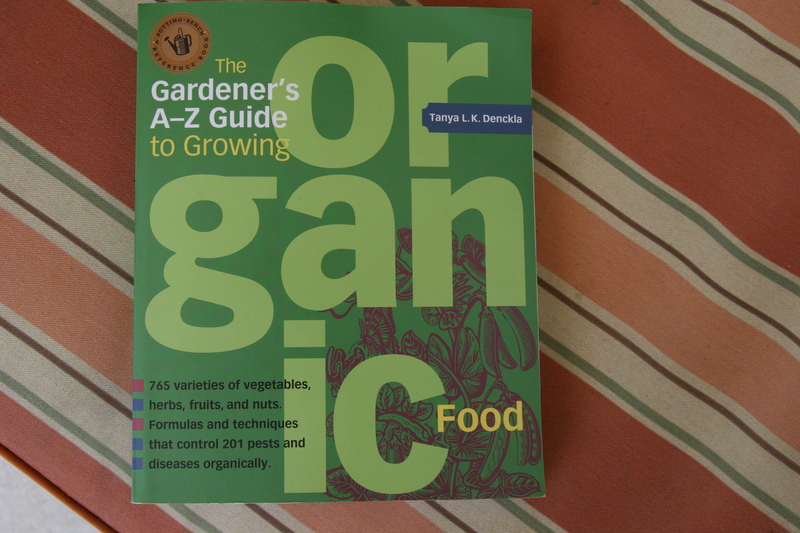 All this gardening has made gardening books my favorite of late, and now I have another one to share: The Gardener’s A-Z Guide to Growing Organic Food by Tanya Denckla (Storey Publishing). This is as promised, an easy reference guide to growing most vegetables, fruits and herbs you can think of — it covers most of the well-known crops I’m trying to grow (no ground cherries, parsnips or horseradish). A big thanks to Storey Publishers, who sent me a complimentary copy of the book to consult and review. The book also covers organic remedies (for pests, disease, etc) and also lists of ally & companion plants (organized in another lovely table). In the preface, the author discloses that the book started as a database where she began to centralize all of the info she was gleaning from a shelf full of books. I admit, I attempted to start just such a spreadsheet after paging through a number of books trying to recall where I read that advice about such and such. I’m happy to give it up now that someone else has already done the hard work for me. When Mom G picked up some peanut seedlings at a local nursery (I would not have thought of growing peanuts….genius! ), this book had just what I needed to get a quick idea of how they grow, where I should fit them into my garden, how to take care of them and what to watch for as the plant matures and is ready to harvest. Quick, to the point and easy to pick out the details I was looking for. I also found the glossary of organic remedies helpful in demystifying some of the tips I’ve read elsewhere. We were noticing some swiss-cheese-like nibbles on our eggplant leaves, and I quickly found the culprit by looking up the eggplant entry to find a list of common pests, and then flipping to the organic remedies section to look up the signs and treatment for that insect — in our case, the lace bug. Remedy: insecticidal soap spray, which I duly applied this morning. As I’ve been keeping this book in my gardening tool bag as my encyclopedia of sorts, I do wish it included some images of what various plants should look like while growing — something I frequently find myself wondering, so that I can tell if my plants are looking healthy, and so I don’t pull them instead of the weeds. (There are some gorgeous woodcut illustrations, but they don’t show you what an emerging asparagus fern or a dill seedling should look like). I also would have appreciated a little more detail on how to care for the plant to ensure a great yield. Most entries do have a few sentences on how to care for the plant, but I found myself needing to consult other books to find, for instance, when to cage up tomatoes and whether/when they should be pinched back to increase fruit size. I have found that when I’m out transplanting and putting in seeds, this is a fantastic first resource with all the essentials outlined clearly. I’m not ready to put the other books back on the shelf just yet as I typically cross-check my questions in various resources, but this book certainly filled a gap in my library. I think this one is going to become the most sun-bleached and soil-smudged of them all. For anyone living on the Eastern Shore, the author is going to be speaking at our brand new farmer’s market! She’ll be at the Onancock Market on June 23 so come visit the market! Here’s the scoop.